When the Second World War was declared in September 1939, Northamptonshire was better prepared for the years that followed than it had been twenty-five years earlier. Lessons had been learned from the First World War, and people were far more aware of the impact modern warfare could have on their lives. Through film, press and radio, they were able to monitor the events in Europe in a way unprecedented by any previous generation, which led to a greater understanding of world politics and a realization that the rise to power of Adolf Hitler would have predictable repercussions. So, when Prime Minister Neville Chamberlain addressed the nation after Germanys armies had invaded Poland, war, for many, had already become inevitable. But what exactly did this mean to the people of Northamptonshire, and how did they react to the threat of invasion? What were the consequences of the conflict on the Home Front? How did Northamptonshire's towns and villages function through six years of grinding warfare? These questions, and many others, are examined and answered in the pages of this book. This is the story of those who were there; the people who never accepted the possibility of defeat, who coped with rationing, blackouts, conscription and aerial bombardment, and then welcomed London's evacuees and greeted the American Air Force with open-armed hospitality. 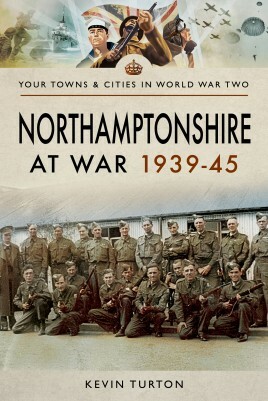 Using military events as a background, this book relates Northamptonshire's story, from the parts played in the war effort by the shoe industry, the Northamptonshire Regiment, the Home Guard, the ARP and to, of course, the people. Author Kevin Turton has been writing non-fiction since the mid-1990s and to date has published thirteen books, covering history and true crime and now writes full time from his home in Northamptonshire.